A walk-in wardrobe or bespoke in-built wardrobe is a fantastic addition to any luxury bedroom and can add value to your home or development. Custom-built wardrobes and dressing rooms allow you to organise your bedroom neatly and efficiently, while maximising the best use of your space. Walk-in wardrobes are a much-coveted luxury and really boost the appeal of a master bedroom. Often used in conjunction with an en-suite or shower room, a dressing room provides a separate space for storing and choosing your clothes and accessories, and keeps any clutter out of the bedroom. A walk-in wardrobe can also serve as a sanctuary space in your bedroom area, providing a link from your bathroom to your bedroom that ensures your clothes are well organised and your sleeping space remains clear and tranquil. When planning a walk-in wardrobe it’s important to consider the best way to make use of the space you have available. If you are planning a refurbishment you may need to move walls or adapt an existing room to create your dressing room. Attic areas usually offer plenty of extra space in the form of awkward corners and unused areas which can be perfect for converting into a private wardrobe. 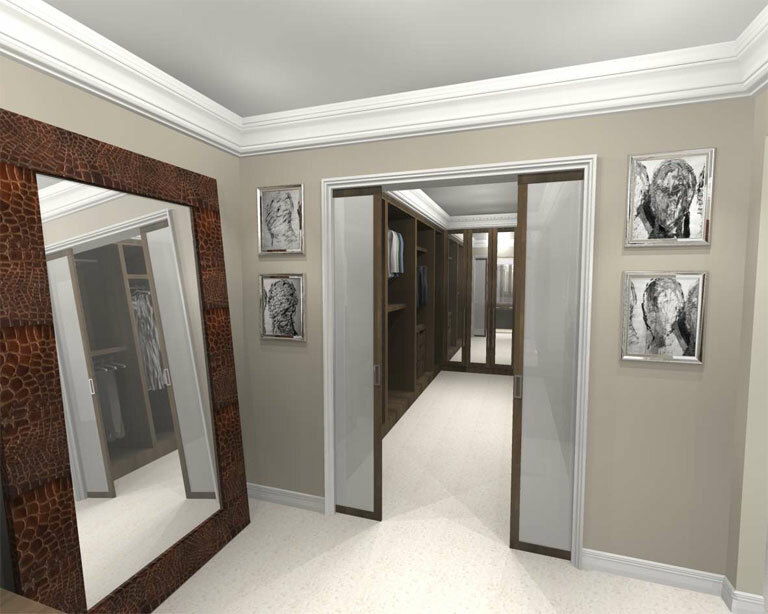 If you are planning a new luxury development, dressing rooms can be incorporated into your design at an early stage along with en-suites, shower rooms and wet rooms. It’s a good idea to position your dressing room in a place that works with the natural ‘traffic’ of the area – ideally adjacent to your bedroom and your bathroom. That way you will have a place to dress and ready yourself for the day after bathing or showering, without the need to clutter up your bedroom with towels, clothes, accessories or beauty products. Useful additions to walk-in wardrobes include seated areas, mood lighting and mirrors so that you can take your time and relax while you get ready. Custom-built wardrobes allow you to save space by integrating your clothes storage into your bedroom and match your overall interior design aesthetic. Bespoke wardrobes can be built into unused space in your bedroom, or simply placed against an existing wall. If you don’t have enough room in your bedroom, space can be created by moving a wall back into another room that can spare a few feet. A built-in wardrobe should be viewed as fixture rather than a piece of furniture – it should blend into your bedroom as a part of your interior design and should be made from high quality materials so it is built to last. Choose from wood, glass or mirrored doors, in colours to complement the rest of your bedroom design. Light colours and reflective surfaces will help your wardrobe to bounce light around your bedroom, while deep, rich colours will add an element of luxury. There are a range of different door styles available, including pivot doors, bi-fold doors and sliding doors – think about how your wardrobe doors will affect your bedroom space when they’re open. 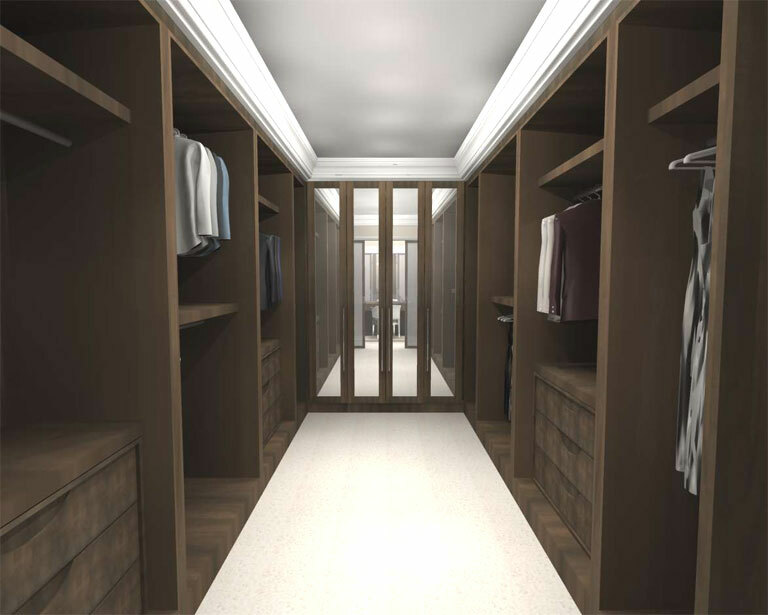 The great thing about a bespoke wardrobe or dressing room is the ability to customise your organisation. 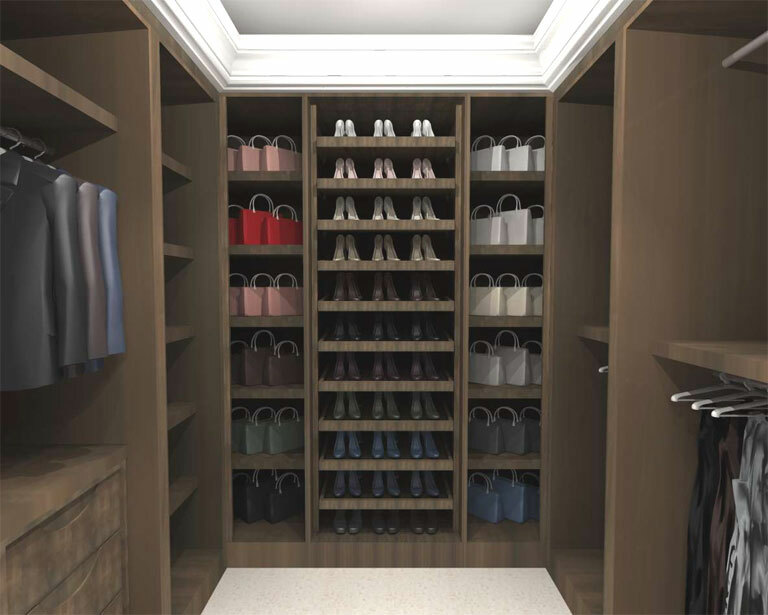 Designate different areas of your wardrobe for shoes, shirts, trousers, hanging items, accessories and boxes to simplify your life and make finding the perfect outfit easy each morning. Combine rails, shelving, drawers and specially designed organisational compartments to create a storage solution that suits your needs exactly. Creating your perfect bedroom space means taking into account the different elements of an ideal sleeping space: a comfortable bed, a relaxing atmosphere, a luxury en-suite or shower room, and storage that complements and enhances your bedroom area. A built-in wardrobe or dressing room is the obvious solution and can add value to your home as well as providing you with an intelligent storage design. Get in touch with us at Concept Virtual Design for help designing your luxury bespoke bedroom. This entry was posted in A3 Colour Design Service, Wardrobe and tagged bedroom interior design, bespoke bedroom design, bespoke wardrobe design, built in wardrobes, custom built wardrobe design, dressing room interior design, luxury bedroom design, luxury wardrobe design, walk in wardrobe interior design, walk in wardrobes. Bookmark the permalink.